One of the tings I like about the Herbivoracious Cookbook is that there is a wide variety of ethnic dishes to try. From Asian to Mexican to Indian. 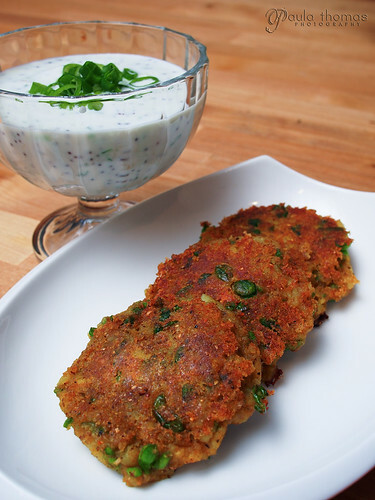 The recipe I chose to try next was another one from the appetizer section, Indian potato fritters (aloo tikki). 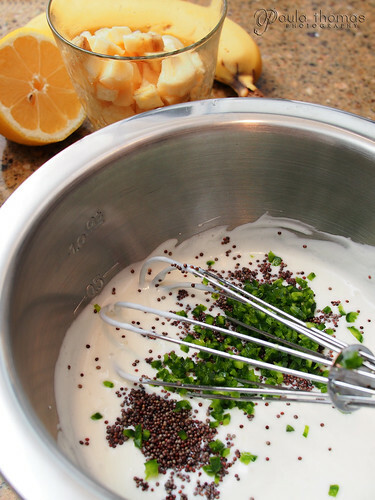 I also made the banana raita sauce which was recommended in the description. I've had a food mill for a long time and never got around to using it until I made this recipe. I have never used one before but seen it done many times and wasn't too hard to figure out. After boiling the potatoes I put them through the food mill to make the mashed potatoes for the fritters. The blade of the mill lies about a half inch from the grate so there was quite a bit of potato that didn't go through so I manually pushed it through the holes. I'm not sure if that is typical or not but it seemed like a lot of extra work to get all the excess through. After looking back at the recipe I may have used more cayenne pepper than the recipe called for. I remember thinking it was a lot when I added it but the recipe only calls for 1/2 tsp and I'm thinking I added more than that. The batch I made was very spicy but not inedible. 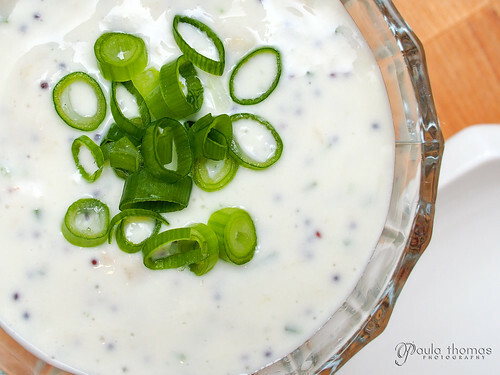 The sauce is yogurt based which is great for cooling your burning tongue off if its too spicy. The specs you see in the sauce are the toasted mustard seeds. The recipe called for black mustard seeds but I only have yellow and brown and didn't want to buy a 3rd kind so just went with the brown. I don't use mustard seeds often and it might have been the first time I've used the seeds. They are so small I was thinking they would get caught in my teeth but they didn't seem to. They gave a nice little crunch to the sauce. I love potatoes so I had to try this recipe and I enjoyed it for the most part. It could have been a little less spicy but that was probably my fault for being so spicy and not the recipe. There's also a recipe for blue potato tarts that is tempting but I need to move onto the next section and make a soup. Thanks for doing this, Paula! You got a nice shot of the fritters, I always find those to be a difficult format of food to shoot.